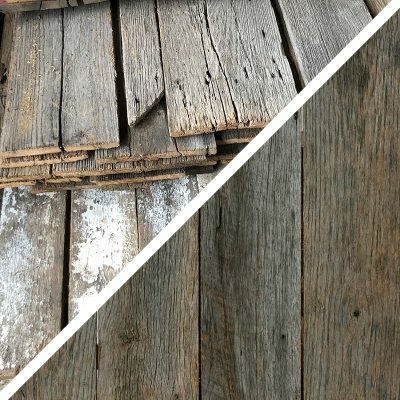 Our reclaimed barn board comes from the East Coast, predominately from old barns and buildings. We carry these patina barn boards in one, two and three inch thicknesses. We have a full spectrum of greys and browns as well as many other colors to help deliver whatever look you are going for. Mushroom Board comes from reclaiming softer woods like hemlock, cedar and cypress from commercial mushroom growing beds and is growing in popularity due to it’s natural beauty and unique washboard-like surface. The smooth finish and expressive grain pattern are characteristic of the planed finish. This unique wood has endured years of acid laden compost, moisture, and abrasion and as a result is one of our most favored character woods. Mushroom Board is an excellent choice for wall and ceiling treatments, cabinetry, door making, and exterior applications.